It took everything I had not to clean up my refrigerator before taking these pics, just so you know. What’s all that crap on the front? This wasn’t actually on the original post, as far as I know, but my fridge is covered in “stuff” that I thought I should explain. There’s the duelling training plans on the lower right side, the family calendar on the top right and the kids’ latest report cards on the left. Also on the left is a pic of The Hubs running Boston and a pic of my oldest son (now almost 12) when he was about 2 – awwwwww. 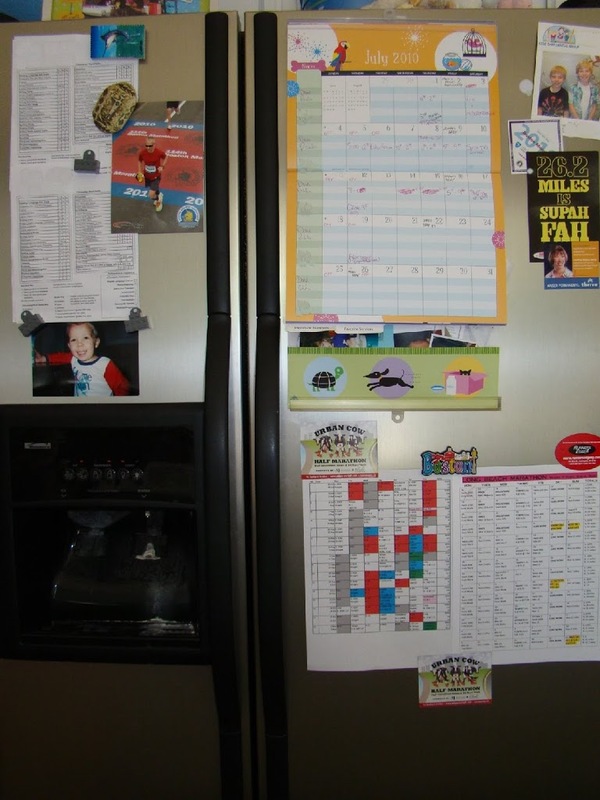 Another highlight: the postcard on the upper right that reads “26.2 Miles is Supah Fah,” one of many souvenirs from Boston. A few things you like in there. 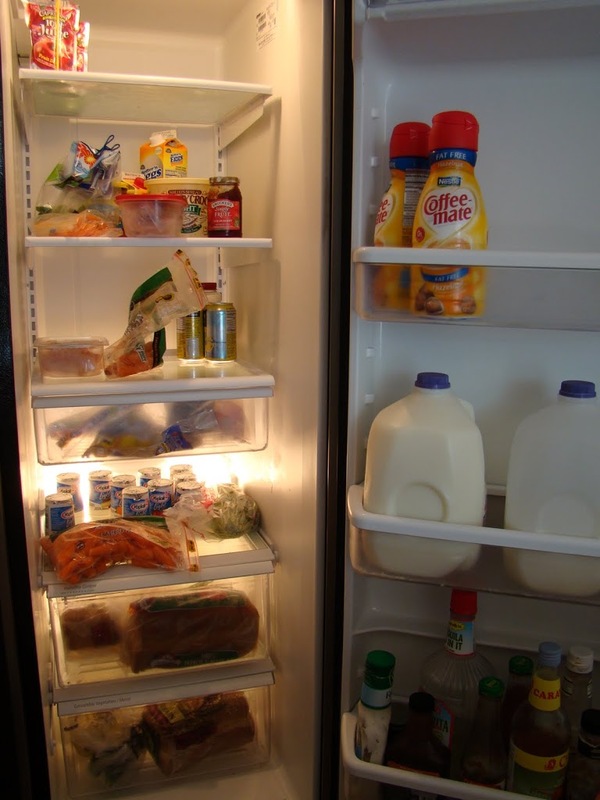 I drink my fair share of the milk (in fact, we’re running low right now with only two gallons – I usually buy at least three), all that creamer is mine, and the carrots are my go-to afternoon snack lately. What you can’t live without. I’ll be honest, I can’t live without the creamer. I take it with me on vacation. What you should live without that is currently in there. There’s a nearly empty bottle of pre-mixed margaritas that’s been in there for about two months – ick! What you wish was in it. Dessert! Okay, I showed you mine, now it’s your turn! The front of my fridge looks a lot like yours! 🙂 We love baby carrots as snacks too…yum! Wow–lots ‘o milk you drink! Nothing wrong with a little margarita every now and then. Hmmm… I’m happy to see that I’m not alone in my creamer addiction.